It was straightners. I think it probablywas a bad batch, but baffled me why they developed the same fault even when replaced with new. That's bad luck, did you buy them from Amazon? I bought my two pairs from John Lewis and look fantastic and they've never had a fault and I've had them going on around 7 years (the second pair around 5 years). Got these as a Xmas present for the Mrs on BF for a not too dis-similar price.. Now we've been going out a long time, I've surprised her with holidays, tickets to events and other extravagances and this.. to this day is "THE BEST" present I've ever got her.. (shock) So it's good one to get in the good books lads. Are those codes no longer working now? Yes but you got the 20% off for first offer and then and extra 15% off for adding 2 items. You must of missed it. First20 applies to all first orders, I just put these ghds as these were the ones I purchased. Who were? Didn’t see anything on HUKD’s for such an offer? Heat spray arrived Yesterday. Delivery date for straighteners says 8th April but nothing so far?? Mines arrived okay. Fingers crossed for those waiting! Or buy from GHD direct for £115 and use code GHDMUM to receive another size 3 brush free (separately boxed) plus £6.90 in cashback from Quidco (that's what tracked for me). Plus a UK plug head guaranteed for a total of £108.10. Worth the extra £4.33 after cashback for the plug and extra brush IMO. Arrived today box looking brand new. But held shut with shoddy sellotape each end of the box. Have sent back for a replacement. Im a bit stumped as to why this went cold? Hot from me! 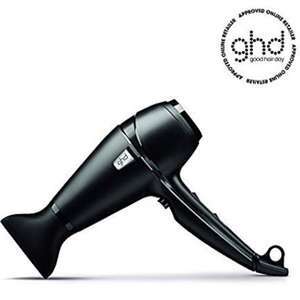 ghd max professional hair styler. £99.99 delivered @ Amazon Deal of the Day. Great this was fate , ordered thanks. I could not sell mine at all. So now I will keep them after all. Still the best glitch in a while. No idea why the cold votes! Have some heat! Never miss a 'GHD' deal again! Curious why this is cold. Wife has mentioned these for a while and this is the lowest I've come across. No idea about these things so wonder why it's not getting heat? Please help... Am I missing something? But all you want to do is dry it right? As in u don't want to style it? See that's where I'm like...why am I paying for something that's going to happen anyway regardless. Mine dries quick so it doesn't bother me that much. I can't be bothered to style it every day either. I guess if you have thick and long hair it would take a lot longer to naturally dry. Also if you wanted to style it every day then I'd go for it. All boils down to what you want from a hair dryer. @bensan888 @nokiafusion @theavail @Karla85 Btw, maybe I should provide context. The reason I discovered this and originally posted this thread, is to do with the price of the ghd Platinum Plus Black/ghd Platinum Plus White which is the lowest I can find online at Cocoon. 11 deals out of 13 ain't bad. Usually £99... went down to about £84 in black Friday sales and over Christmas, now £79!! Which is a £20 saving. Absolutely brilliant hairdryer as well. What does an expensive hair dryer do that the 2200w ones you can get for £12-£30 cant do?. So did I but I emailed them a complaint and I recived my order today. They said the would hourner it as a good will jester. What did you reply and how did they respond? No, thank you mate. Because of your post I managed to make £60 odd profit. That money came in real handy in a hard financial time for our household. So thank you. THANKYOU all! because of this thread we made it into this list https://www.hotukdeals.com/discussions/deals-of-the-year-2018-are-you-in-the-list-3178109 second most commented post OF THE ENTIRE YEAR! and it was only posted with 4 days left of 2018 and the FIRST mentioned deal in the top beauty deals. I haven’t either. Has anyone tried chasing it? Code wouldn’t work last night, tried live chat as someone suggested and they refused to entertain it. They will not sell for £75. Incase anyone else (like me) missed out on getting these in the Black Friday sale - reduced by £25! Good Hair Day is one of the world’s leading manufacturers of hair straightening irons, and their products are a daily essential for millions of women in the UK. Here’s the low down on what they have to offer, how to choose the right straightener and how to get great deals on GHD products. Since being founded in 2001, GHD have risen astonishingly quickly, becoming a world leader in designing user-friendly, high-quality hair straightening equipment. Now, their products are a mainstay in 50,000 beauty salons worldwide, and they are a go-to brand for British women who need to keep frizzy, frazzled hair at bay. Although the company started out solely as a retailer of hair straighteners, it has diversified significantly, adding curlers, hair dryers and brushes to its rapidly expanding product range. What Can You Use GHD Products For? GHD specialise in selling devices to (generally) manipulate women’s hair. Their straighteners can turn frizzy bedheads into sleek, well-presented looks with a few seconds of application. Their hair dryers offer an affordable, reliable way to dry off just-washed hair and deal with the effects of rain, while their curlers enable women to shape straight hair into elegant waves and curls. So, what exactly is on offer from GHD? The core of the company’s product range that you find on their website at www.ghdhair.com is their collection of hair straighteners, but within this collection, there’s plenty of variety. Customers can choose the right product depending on how their hair styles and their favourite looks. The GHD Gold Series – Comes in classic, mini and max varieties. The classic variety is suitable for all hair types, features large gold plates with smoothly contoured edges and a safety mode that switches the plates off after half an hour to prevent accidental burns. Max stylers have larger plates, which will help women with thicker, curlier hair, while the Mini variety comes with slender plates that allow you to style your hair with complete precision. 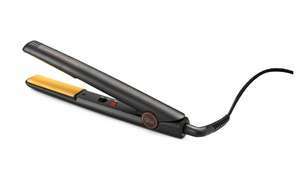 The GHD Eclipse Styler – The Eclipse was the first GHD styling tool to include the tri-zone system. This innovative heat distribution technique ensures that no part of the ceramic plates become super-heated, avoiding most instances of scorching. The GHD Platinum Collection – Comes in white, black, copper and pink varieties and offers a slight improvement in quality over the Eclipse and a significant improvement over the Gold Series. The tri-zone system modulates the amount of heat applied to your hair, making you less vulnerable to heat damage, while the thin plate and wishbone shaped hinge make this straightener easy to manipulate with precision. Also comes with a handy heat resistant bag. Hair dryers – Includes the GHD Air hairdryer with a 2,100W motor that generates enough air pressure to dry hair quickly. The temperature can be rapidly shifted from high heat levels to extremely cool thanks to the “Cool shot” function, while a 3m long cable makes the hair dryer extremely mobile as well. Also features the more expensive GHD Aura hair dryer which delivers a more concentrated jet of hot air and technology which lowers the temperature of the casing, avoiding uncomfortable overheating. It’s also lighter and quieter than most competitors. GHD Flight – GHD Flight is a separate part of the company's hair dryer range and has been especially designed for travellers to use. It's extra-lightweight design, protective bag and quick drying properties make it ideal for taking with you on flights and road trips. Small enough to slip into hand luggage, you can even freshen up on long-haul flights with this in your armoury. Hair dryer accessories – The Aura and Air can both be fitted with useful accessories like diffusers, while customers can purchase dust bags to keep their GHD hair dryer in peak condition for as long as possible. Curlers – Includes GHD curve tongs which maintain an exact temperature of 185 degrees Celsius, the optimum level for curl formation. Also features safety stands and a "Cool tip" to protect hair as you curl and automatically shuts down after 30 minutes of inactivity as a safety measure. Also includes GHD curve wands which come in a variety of barrel dimensions to create exactly the right shape of curls and can be combined with styling gloves to keep your hands safe as you manipulate your hair. Hair products – GHD don’t just sell equipment. You can also buy high-quality hair care products like curl hold sprays, split end therapy creams, straight and smooth sprays, final fix hairsprays, root lift sprays, volumizers and straight and tame sprays. Hair brushes – Features a range of brushes that includes radial brushes, detangling combs, dressing brushes, paddle brushes and tail combs. If you require an item for hair care purposes, GHD will probably stock it, so whether you are having issues with taming your curls or you want to add some volume to a lifeless head of hair, check out their product listings and their HotUKDeals pages. Why Buy GHD Straighteners or Hair Dryers? GHD sells a very broad range of hair care devices and accessories, but why should you buy their products instead of those from competitors like BaByliss (/tag/babyliss) or Valera? 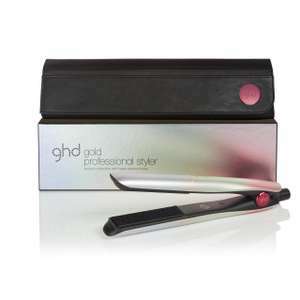 GHD offer stylers and curlers for all types of hair, and their products are also versatile. So, if you regularly change the length, cut or style of your hair, you can keep on using your Max or Mini straightener to ensure a Good Hair Day. They are also known for their precision styling. Both GHD curlers and straighteners are designed to work at precisely 185 degrees Celsius. That’s the magic number as far as hair care experts are concerned, as it conditions hair to fall into whatever shape you desire. Safety is another strength of GHD. Aside from the automatic 30 minute shut down feature that they have incorporated into all of their heat-related devices, GHD have also taken steps to minimise heat damage. Heat damage is the number one problem with poorly made styling equipment, but it’s less of an issue with collections like the GHD Platinum range. That’s due to the tri-zone system that the Platinum straighteners use. It distributes hear evenly across the pads, instead of collecting heat at certain hotspots. With the heat evenly spread across the pads, it’s easier to avoid scorching your hair accidentally and you should obtain a better finish as well. That’s the positives. What about criticisms of GHD products? Well, in some cases, GHD straighteners have been reported to experience heating problems and, when you are in a hurry to get to work and need to avoid frizz, it’s incredibly frustrating when your straighteners won’t heat rapidly. However, that’s an issue with individual products, and GHD’s customer service team should be able to sort out a replacement quickly. Some customers have reported that GHD products aren’t as durable as those from competitors like Remington, but they still compare well with most straighteners on the market. Another criticism of GHD is that they source most of their products from Chinese suppliers, which has led some to question whether their quality control mechanisms are watertight. While that may be valid, there does not seem to have been a noticeable deterioration in the quality of their products since they moved production to the Far East. The bottom line is that GHD tends to have an excellent reputation among UK hair care fans, and you can be confident that your curlers or straighteners will perform well over the long-term. If you’ve decided to purchase a brand new set of straighteners or a GHD hair dryer, take a little time to think about your options. Firstly, make sure you are buying the right product for your hair type. If you have short hair, slender straightening irons are probably ideal. Anyone with thicker, longer hair will prefer larger irons as they find it easier to penetrate densely packed hair. Then again, if you enjoy working on your hair for extended periods, smaller plates offer more precision. Price could be another issue. GHD’s straighteners tend to be in towards the middle and higher reaches of the price range (and you can certainly find much cheaper alternatives on the high street). However, think again if you want to buy straighteners on the cheap. The all-ceramic plates used by GHD cost more than ceramic coated or other types, but with their even heat distribution and the other heat management features offered by GHD, they will produce better results and less damage. That might be worth spending an extra £50. Speed is also a factor. While GHD straighteners are high-quality and safe to use, they aren’t the fastest straightening irons on the market. Cheaper designs with metal plates will tend to heat up faster, so they may be more appropriate for people who are usually in a hurry. If you are confident about your ability to avoid scorching your hair or skin, a cheaper iron could be ideal. As for GHD hair dryers, the usual considerations apply. Is it necessary to spend over £100 on a hair dryer or would you be content to spend much less, but have a less precise device? The great thing about products like the GHD Air and the Aura is that they produce an extremely focused blast of air in no time at all. This allows you to dry off freshly washed hair in a matter of minutes and be ready to go out much more quickly. Precision is another major plus. The tightly focused jet of air produced by both models allows you to work on small patches of your hair while leaving everything else undisturbed. With both straighteners and hairdryers, it’s all a question of how seriously you take hair care. If you are the kind of person who feels terrible if your hair hasn’t been tamed in the morning, it’s definitely worth spending more for high-quality hair care equipment. And, if you check out the GHD offers at HotUKDeals, you can often find their products at bargain prices, making them even more worthwhile. Should You Buy GHD Hair Care Products? As noted above, GHD is about much more than hair dryers and stylers. They also sell a wide range of hair care products like volumizers and tamers. However, their most popular product is probably their heat protection spray. Is it worth buying? Whether you have purchased a GHD styling tool or curling wand, or you will still be using a competitor’s equipment, the answer is almost certainly yes. The spray works by coating hair with a protective layer before you use stylers or curling irons. All it takes is a few sprays to the roots of your hair before taking a couple of seconds to spritz the spray along the length of each hair and then combing it through. Bloggers and reviewers tend to agree that the claims made by GHD for the spray hold up. It actually does provide robust protection against heat damage and even leaves hair looking shinier as a result. This makes it a handy accompaniment to GHD curlers and stylers (as well as an ideal gift idea too). Getting hold of GHD’s hair dryers, stylers, curlers, accessories and hair care products is simple and there are several ways to do so. One way is to go to the GHD website itself. Here you’ll find details of their full product range along with product specifications and descriptions of how to use each item. When you’ve found the right product for you, just add it to your shopping basket and checkout as you would at any other online beauty store. You can also search for all of GHD’s products on Amazon and eBay, where you can take advantage of customer reviews and there may be a few bargains (particularly on older products like the Eclipse, which has been superseded by the Platinum range). 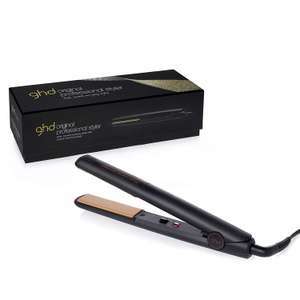 GHD’s products are also available from a wide range of high street retailers. They can be found at HotUKDeals merchants like Boots, Argos and Regis Salons, so it may be possible to pay them a visit and check out what’s on offer. When you do, be sure to check the HotUKDeals listings for any current GHD deals. The company regularly runs promotions. For example, as Christmas approaches, many of their devices come with free gifts like heat protect spray as free gifts. When Black Friday arrives make sure you check their listings for big discounts, and visit their pages when Boxing Day comes around as well, as they usually offer generous savings in the New Year’s sales. If you’ve decided that you need to spruce up your hair care collection with a new GHD straightening irons, curling wand or Aura hair dryer, make sure you get the best possible deal. GHD offers premium products and their prices can be relatively high, but with regular discount deals you should be able to find a bargain. Whatever you do, be sure to check out their HotUKDeals listings to find the product you desire.